, a celebrated musician, and doctor in that faculty, was descended from a family of that name in Somersetshire, and born about the year 1563. Having discovered an excellent natural genius for music, he was educated in that science, when very young, under Mr. William Blitheman, an eminent master, and organist of the chapel to queen Elizabeth. On the 9th of July 1586 he was admitted bachelor of music at Oxford, having exercised that art fourteen years; and, we are told, he would have proceeded in that university “had he not met with clowns and rigid puritans there, that could not endure church-music.” Some time after, he was created doctor of music at Cambridge; but in what year is uncertain, there being a deficiency in the register. In 1591 he was appointed organist of the Queen’s chapel, in the room of Mr. Blitheman, deceased; and on the 7th of July, the year following, he was incorporated doctor of music at Oxford. He was greatly admired for his fine hand on the organ, as well as for his compositions; several of which have been long since published in musical collections, besides a large number in manuscript, that made a part of the curious and valuable collection of music lately reposited in the library of Dr. Pepusch. 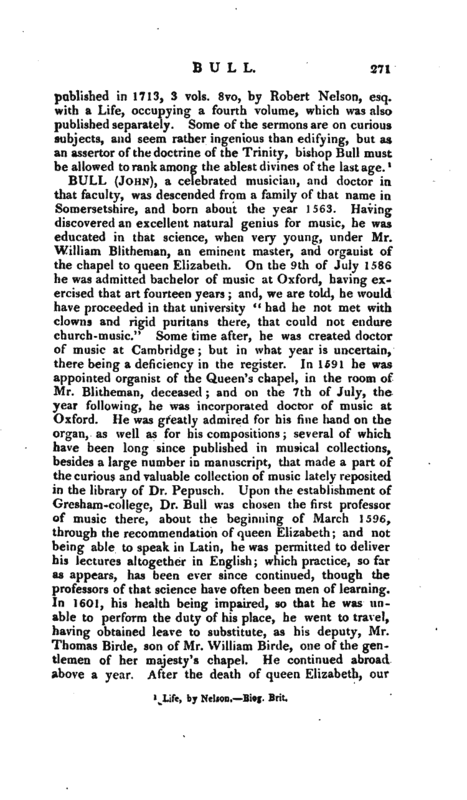 Upon the establishment of Gresham-college, Dr. Bull was chosen the first professor of music there, about the beginning of March 1596, through the recommendation of queen Elizabeth; and not being able to speak in Latin, he was permitted to deliver his lectures altogether in English; which practice, so far as appears, has been ever since continued, though the professors of that science have often been men of learning. In 1601, his health being impaired, so that he was unable to perform the duty of his place, he went to travel, having obtained leave to substitute, as his deputy, Mr. Thomas Birde, son pf Mr. William Birde, one of the gentlemen of her majesty’s chapel. He continued abroad above a year. After the death of queen Elizabeth, our | professor became chief organist to king James I. and December the 20th, the same year, he resigned his professorship of Gresham-college; but for what reason is not known. In 1613 he again left England, induced, probably, by the declining reputation of church-music, which at this time had not that regard paid to it, tfrat had been formerly. He went directly into the Netherlands, where, about Michaelmas, the same year, he was received into the service of 'the archduke; and Mr. Wood says he died at Hamburgh, or (as others, who remember him, have said) at Lubeck. His picture is yet preserved in the musicschool at Oxford, among other famous professors of that science, which hang round the room. Biog. 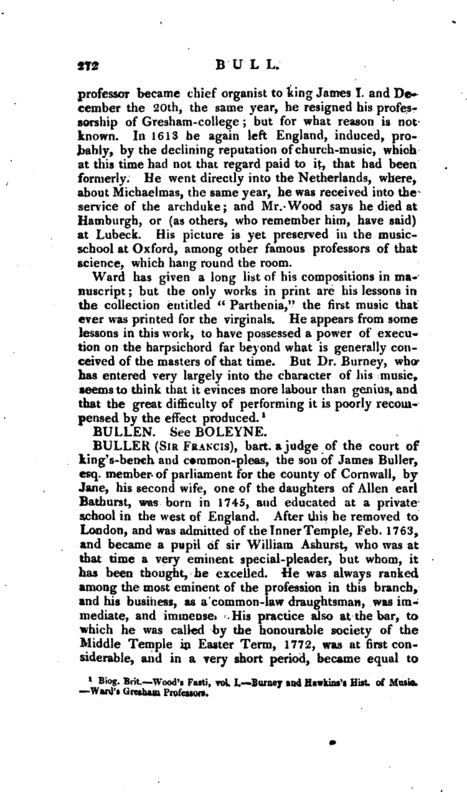 Brit.—Wood’s Fasti, vol, I.— Burney and Hawkins’s Hist, of Music. —Ward’s Gresham Professors.